Design Systems, Ltd. — it is our name, and it is what we do. 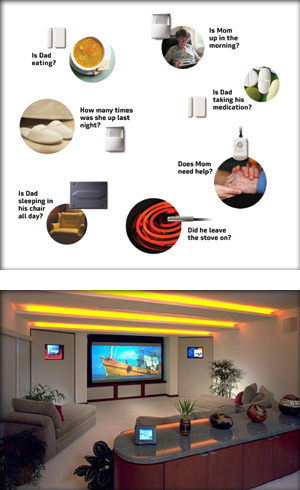 We have been designing and installing extraordinary home electronic systems for over 20 years. And Design Systems, Ltd. has now partnered with CloseBy Network to offer even greater flexibility of system capabilities at prices that are more affordable than ever before. With the CloseBy Network alliance, we offer home activity systems that are perfect for keeping our parents and seniors in their homes longer and more comfortably while you and/or selected caregivers monitor their activities and are being alerted to selected activities that are out of the norm. You decide what and how to monitor, including daily reports and even video cameras. These home activity systems provide you with Remote Peace of Mind (RPM) — you can feel “CloseBy” to your loved ones, no matter where you are. We can make your lifestyle more enjoyable by providing high-performance music, video, and data networking technology throughout your home. We can also make your life more convenient (not to mention more economical) by automating control of your home's climate, lighting, security and other key home systems, including off-site remote control. Your system can be as basic or as comprehensive as you like — the choice is entirely up to you. The fine execution of this kind of system does not happen by accident. It only happens by design — the result of the combined, well-coordinated efforts and special expertise of many talented people. Our refined electronic systems enhance your surroundings and your life by being both highly capable and easy-to-use. And our systems do not call attention to themselves. They are designed to be discreet, blending unobtrusively into your home's interior and exterior spaces. Excellence in interior design is hard to achieve. Once attained, the clutter associated with ordinary component systems would be intrusive and intolerable. We carefully conceive and meticulously oversee each and every aspect of your custom system so that it blends seamlessly into the most discriminating decor. This is the whole idea behind a refined electronic system from Design Systems Ltd. Truly fine home electronic systems are comprised of many separate components. They must be assembled and installed by means of many different skills to form a coherent whole. Seemingly small details can make the difference between an outstanding system, or one that is merely acceptable. There is more our systems than quality components and careful installation. As important as these things are, the concept and design aspects are even more significant. Advanced electronic systems are complex things, but Design Systems Ltd. makes them easy for you to enjoy. The key to our success is found in attentive coordination of the project, from beginning to end. By doing so, we create refined electronic systems that are in complete harmony with you and your home.